I have loved Virago Modern Classics for almost as long as they have existed. I think the first one I picked up was Angela Carter’s The Magic Toyshop. I was intrigued at the prospect of an adult novel with such a title. I was not disappointed. Quite the opposite, and I quickly read my way through anything bearing Angela Carter’s name. Rebecca West’s The Return of The Soldier was next. A slim volume – a novella really – but it said so much. Back in those days VMCs came dressed in green covers and so they were very easy to spot. I can still clearly recall a stand full of lovely green books just past the entrance of my university bookshop. If only I’d had a book-buying budget. Many of the books that must have been there are no longer in print and not easy to track down today. But I discovered a row of Willa Cather Virago editions in the library and worked my way steadily through. And a few year later I found discovered Kate O’Brien in another library. Mary Webb in a secondhand bookshop. Elizabeth Taylor, Julia O’Faolain, Molly Keane, Edith Olivier… so many wonderful authors, so many wonderful books preserved. There are things I could criticise. One or two dubious book choices. The dropping of the iconic green covers. And some recent additions to the list that were well-known and not particularly in need of rescuing. But that’s for another day. There is so much more good to say. I’ve built up quite a collection over the years. Here it is! The latest addition – the one that completed the quest – is particularly special. VMC #18 – Pilgrimage by Dorothy Richardson is, by all accounts, extraordinary. A series of 13 books written over a lifetime, and now collected by Virago in 4 volumes. It remains in print, but I didn’t want shiny new editions. I wanted the first Virago editions. I waited. I wanted the right edition, but I wasn’t prepared to pay silly money. Graduallly they came to me. Volumes 1 and 4 in a secondhand bookshop on a day trip. Volume 2 in the Oxfam shop – I saw it in the window one evening and rushed around the next morning. And last week volume 3 appeared on Ebay. Mission accomplished! I love the subtle differences between the four cover paintings. But Virago artwork is a subject in itself, so I’ll leave that for another day too. Now, of course, the reading begins. I’m given to understand that although they are wonderful books they are not the easiest reading, so it will be a long-term project. “Miriam left the gaslit hall and went slowly upstairs. The March twilight lay upon the landings, but the staircase was almost dark. The top landing was quite dark and silent. There was no one about. It would be quiet in her room. She could sit by the fire and be quiet and think things over until Eve and Harriett came back with the parcels. She would have time to think about the journey and decide what she was going to say to the Fraulein. Congratulations on completing your beautiful collection! Thank you. There are still more VMCs I have to find, but I am delighted to have this particular series complete. I love posts that are just about the PHYSICAL books themselves, about how they make you feel. I love used books for precisely the reason you mention above- it feels like I have accomplished something, somehow, by looking so long and patiently for something that I know is worthwhile. I love the history of older books and being part of a chain of readers across the years. And aren’t the best books worth waiting for?! I hate having part of a series. I don’t like starting not knowing if I’ll be able to finish, and so I’ve been waiting a while. What a wonderful post! As you know I’m a big Virago fan too (it’s not surprise that our library thing collections overlap by 209 books) but I don’t have quite as many as you…yet. I do love the old cover art. I’ve yet to read Pilgrimage – a little daunted by its length I think so hopefully you can inspire me. My plan is to treat Pilgrimage as the original 13 books rather than read volume by volume. It’s going to be a long project! Congratulations on finding so many wonderful books! I haven’t read that many viragos, but I do have several on my shelves. I look forward to seeing your thoughts on Pilgrimage and hope I can read a few more green books soon. My VMCs are my main book collection. Maybe you could post your Viragos one day and let us Viragoites make our recommendations?! I do love the green Virago’s there is just something so beautiful about them. Have you seen Verity’s Virago Venture blog I think you would love it if you havent already found it. I have a Virago bookcase and it is a joy! And yes, I’ve been keeping an eye on Verity for a good while now. It’s taken a long time to build my collection, but those green spines are addictive, aren’t they! Wow! Absolutely gorgeous and how wonderful to own all those amazing books not to mention the joy of reading them. Yes, they are lovely. I’m glad I discovered Virago young. And it was Virago that lead me to Persephone too. Those are gorgeous!!! I would love to see them in person! Yes they are, and I’d love you to have the chance! I liked the green covers too. They were so distinctive. The new ones are very generic and don’t stand out at all. I like those opening paragraphs too. I’ll be interested to see how you get on with Pilgrimage. And with the green covers you could see the links from author to author. There are lots of books I might have missed had I not seen a green spine. Yes, I do have the anniversary editions. 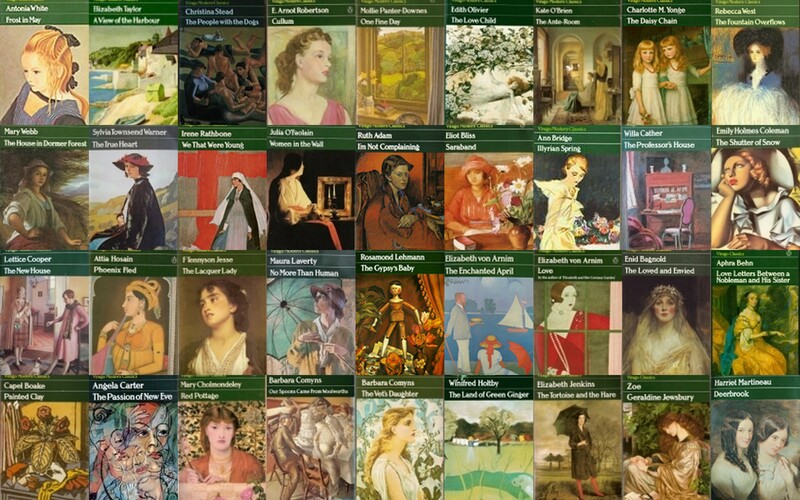 I was a little disappointed that Virago didn’t go green for the 30th anniversary, but I suspect that readers love that history more than the company. I can see the parallels with Penguin, but for me the gren doesn’t feel as dominant as the orange. But maybe that’s because I’ve been looking at the green for so long! Oh, what a wonderful post! And I love the story of your discovery of these four volumes. Thank you! I am still looking for the third one as well; they are tricky to find in Canada it seems. I’ve only read the first volume though, so I have some time yet to gather the third I suppose.